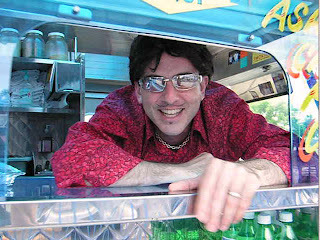 The 99 Cent Chef reads his grocery store mailers every Tuesday. One of the best monthly deals he is alway on the lookout for is 99c lb. pork shoulder country style ribs from Albertsons. Cut into 1/2 lb. strips and carrying little to no bone, all that is needed is to trim the fat. These meaty ribs are the basis to many of the Chef's favorite specialties including a Hawaiian Lau Lau roast pork in banana leaves and a south-of-the-border Mexican styled pork in green chiles. 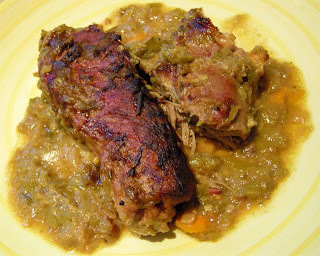 Slow roast until the meat flakes; the green chiles provide a mild heat that compliments sweet caramelized pork. Make sure to fill your baking dish with the country style ribs as you will use the succulent meat for tacos and burritos the rest of the week. 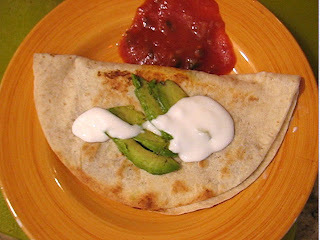 Also, keep a look out for a great Deal of the Day -- wheat tortillas at 99c only Stores. While sauteing onion, bell pepper and garlic trim fat from ribs. 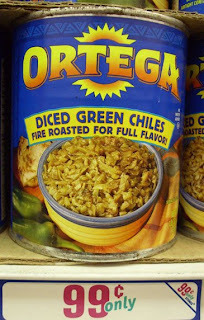 Add cup of wine, pork and can of diced green chiles. Liquid should be no more than 3/4 of the way to the top, if too full reserve liquid until later and add to pan as sauce is reduced. Bring to a boil, then move to a 350 degree oven to bake for 3 to 4 hours, uncovered. 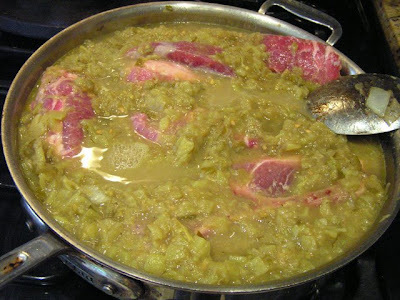 Meat will easily fall apart when done. The pork will brown nicely when cooked uncovered in the oven. Skim off fat and serve with 99 cent black or pinto beans and rice on the side. A Spanish Paella's golden hue comes from the most expensive spice per ounce in the world - saffron. How does the 99 Cent Chef get past this hurdle? 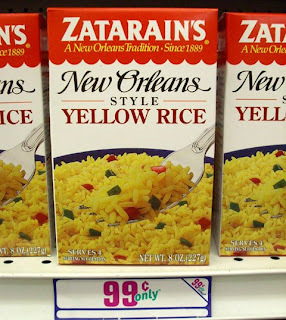 A 99 cent box of Yellow Rice by Zatarain's, for sale at the 99c only Store, provides the answer. For being a rustic Spaniard laborer's meal, Paella includes another high priced ingredient, seafood. The Chef leaps this expensive hurdle by purchasing 99c frozen fish fillets and a 99c seafood package mix of octopus, squid, shrimp and krab. Another main ingredient, Mexican chorizo sausage, is found at 99c only Stores, too -- the texture of Spanish chorizo is quite different than Mexican chorizo: solid rather than crumbly, although the flavor is similar. Enjoy the 99 Cent Chef's Seafood Paella with all ingredients purchased at local 99c only Stores. 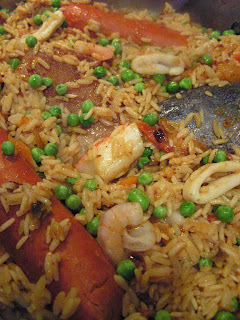 This European rice and seafood dish is worth its weight in gold! 1 6oz. 99 cent package fish filet: pollock, tilapia - whatever they have is fine. 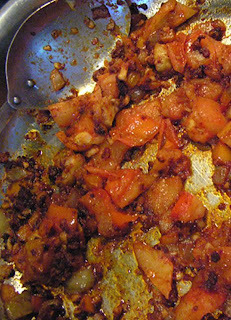 Saute Mexican chorizo until soft and crumbly. Make a sofrito by sauteeing the garlic, onion and tomatoes in chorizo; cook until the tomatoes are soft (5-10 minutes); season with salt and pepper. Add rice, stirring to coat the grains. Pour in the water and wine; simmer for 10 minutes. Do not cover or stir. 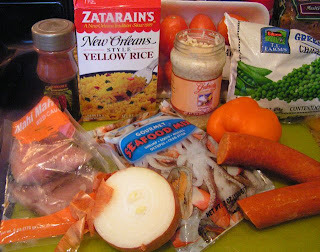 Add package of seafood mix, fish (bury fish as it takes the longest to cook) and link sausage. Mix together gently and just let it simmer without stirring, until the rice is al dente, about 15 minutes. Scatter the frozen peas on top, cover and continue to cook for 10 minutes. The ideal paella has a toasted rice bottom called socarrat. Turn off heat and let paella set for a few minutes. Serve with lime or lemon wedges. The 99 Cent Chef cast his net wide to bring in these 99c items. Is this the end of The 99 Cent Chef? With rising gas prices, food will be more expensive in the foreseeable future. The Chef may be forced to hang up his apron and put away his whisk. Are 99 cent food deals going the way of the vinyl record? As a preview of things to come, The 99 Cent Chef shall be referred to as The $1 Chef for this post only. 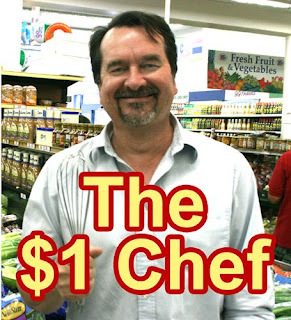 Hi, I would like to welcome you to my new blog, The $1 Chef. My epicurean goal is to create and find great $1 meal deals for you. 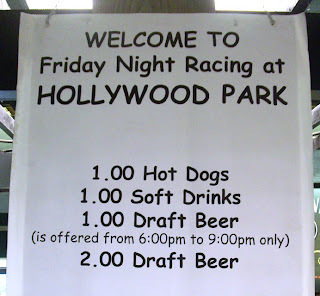 For my first post as The $1 Chef, I would like to take you out for Friday $1 Night at Hollywood Park Racetrack. For a gambling experience, The $1 Chef is more "Ocean's 11" Frank Sinatra than glitzy Celine Dion, and Hollywood Park is Rat Pack cool -- celebrating 70 years this season. The $1 Chef discovered $1 night at this South L.A. racetrack after moving to the Baldwin Hills area several years ago. Parking is free with a $7 admission, and another $3 for a Club Pass gets you in for live music after the last race -- typically, old "New Wave" groups like the Smithereens, English Beat and last night's season closer, Berlin, led by stripper styled, cougar-in-the-making Terri Nunn. 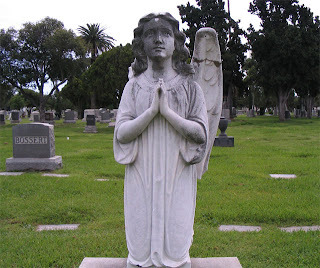 To reach the racetrack, located near the L.A Airport, exit the 405 freeway and take Century Blvd. east about a mile. Just last night, The $1 Chef cruised in with an open sunroof, enjoying the warm, balmy evening while watching silvery big birds, in formation overhead, drift in for a landing at LAX. 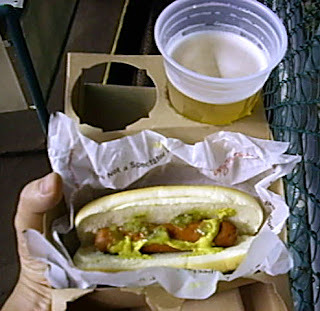 Upon arrival, The Chef recommends getting your $1 beers first, as you will need a couple waiting in long lines for $1 hotdogs. The racetrack vibe helps disguise lukewarm wieners in stale buns, while off to the side, you'll find small packets of relish and large jars of Dijon, ketchup and regular mustard. Go park yourself in the bottom level as close to the action as you can get. After a few beers, you'll be having a great time watching the jockeyed horses rumble down the fairway every half hour and the hotdogs will taste great! 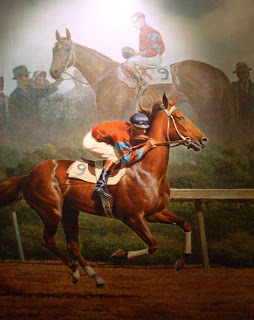 Sadly, tonight's the last night of the season to see horse racing. Be sure to come visit the Hollywood Park racetrack next spring on a Friday night, and look for the The $1 Chef betting a $1 Exacta. UPDATE: Hot dog and beer deals are no more, but there is a large selection of cheap eats offered by a courtyard full of food trucks. Live music is still happening for $10 before 8:30pm -- so that is still a great deal. Some of the groovy outdoor shows I've seen lately include: Joan Jett, Jesus and the Mary Chain, Devo, English Beat and Michael Franti. Play it here. Video runs 1 minute 15 seconds. The 99 Cent Chef has a way with meatballs; riffing by adding spinach with unique 99 cent meat combinations. 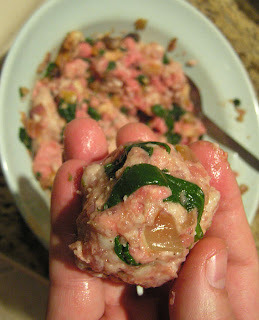 Mixing breakfast sausage and ground turkey makes a meatball so light it almost floats off the plate. 99c only Stores carry prepackaged fresh spinach, so it's a natural progression to blend the side dish into the entree -- combining sauteed spinach and meatballs. For a simple sauce, chop up those once-fresh tomatoes that are going soft hanging out in the bottom of your vegetable crisper and add them to 99 cent canned tomato sauce. In a large pan or pot, saute bell pepper, celery, onion and garlic for 5 - 7 minutes in a tablespoon of oil. Add the spinach and cook until wilted, a couple more minutes. In a large bowl mix sauteed veggies, ground turkey, pork sausage, egg, milk and toasted bread. Season with salt and pepper to taste and add 1 tbsp. dried herbs. Form meat mixture into meatballs, any size you like (I've gone with large ones) and add to the heated pan. Brown the meatballs about 5 - 10 minutes each side; you may need to do it in a couple of batches. Partially covering the pan helps firm up the meatballs by steaming, thus making them easier to turn without breaking apart. Deglaze pan with 99 cent red wine; add chopped tomatoes (optional,) tomato sauce, one tbsp. 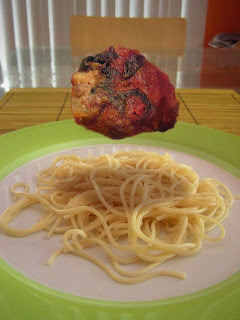 dried Italian herbs and meatballs. 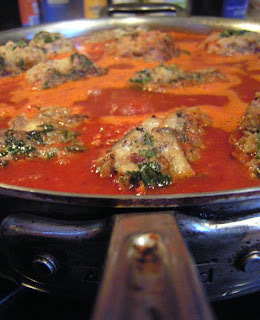 Cover and low simmer meatballs in sauce for 1-2 hours until sauce is reduced by half. Serve over your favorite pasta. Rudolph Valentino.) 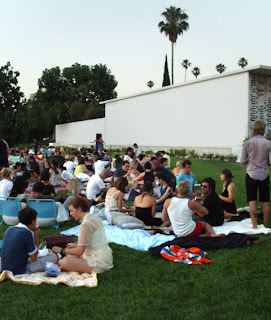 Cinespia's outdoor summer film series in Hollywood Forever Cemetery is off to a steamy start, and for $10 (plus $5 for parking with a carload of friends - locals park off site and hoof it), it is on The 99 Cent Chef's summer must-do list. and get your appetite and buzz on. 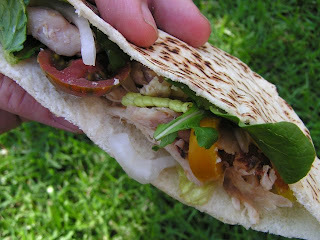 For your picnic pleasure, The Chef creates a chicken pita delight stuffed with shredded chicken, lettuce, tomato, onion and avocado. 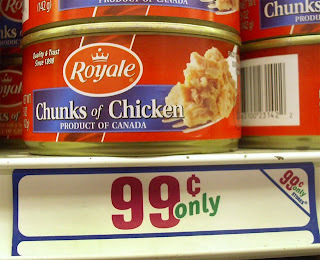 The chicken is 99c only Store canned; of course, if you want fresh chicken use the Chef's film - themed "Russ Meyer Lemon Chicken" recipe. 99c only Stores are carrying tomato (black cherry), lettuce or spinach (organic baby arugula blend, too), and pita bread; don't forget to bring a few bottles of fine kosher Argentina Malbec red wine from the Hollywood 99c only Store. Drain and break apart canned chicken and store in a container. Slice lettuce and tomato and store in separate containers as well. Slice pita in halves. Open and slice avocado at cemetery. Bring plenty of wine.